You are here: Home / Blog / Appetizers / Homemade Pretzels with Sriracha Beer Cheese Sauce…Oh My Goodness, these are GOOD! 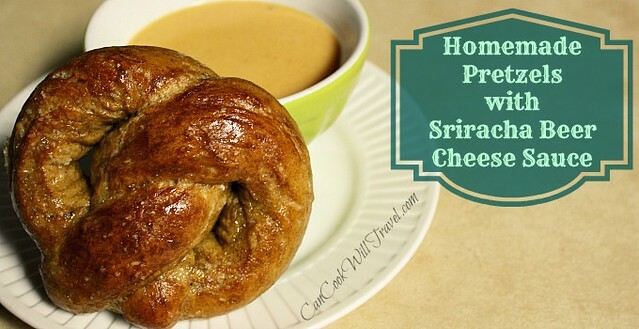 Homemade Pretzels with Sriracha Beer Cheese Sauce…Oh My Goodness, these are GOOD! It’s World Series time, and for the first time that I can remember, my team not only made the playoffs but we’re in the freaking world series!! So I really wanted to make something that would be great to munch on while watching the game or tailgating so I bring you Homemade Pretzels with Sriracha Beer Cheese Sauce…yummy! But back to the pretzels. I love soft pretzels. The yeasty smell, the bit of salt in each bite, and the chance to dip it in cheeese sauce make it a fabulous food for game day (or let’s be honest, any day). I’ve never tried my hand at making pretzels, so now was as good a time as any to see what I could do. I think they turned out pretty damn great, I gotta say. To me, the key with making any type of bread with yeast is getting the water temperature for the yeast just right. For the dry active instant yeast, it’s typical you’d need the water between 105 and 110 degrees. Otherwise just start adding your flour. Dough is all about feel, so if it’s still sticky keep adding flour. If it’s stiff, add water. I used a combo of all-purpose flour and whole wheat flour and this was a great decision! Super easy to alternate the flour and gives the texture more of a bite. Then just roll out the dough into ropes and form the pretzels then boil them up for about 30 seconds. 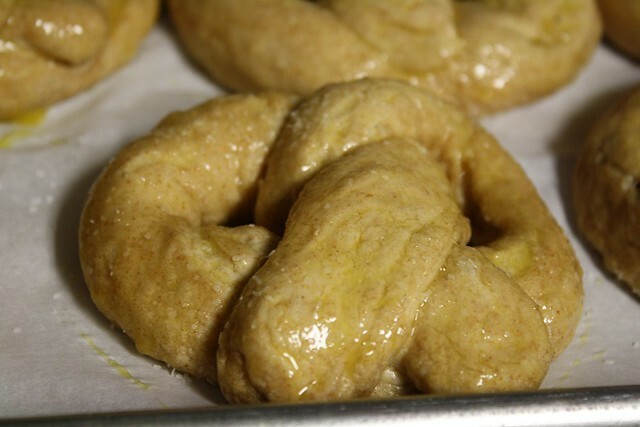 Bake the boiled pretzels and ta-da! They’re done! For the sauce, you know I had to go for something spicy, right?! You can always omit the sriracha or put in less…it’s your sauce so make it work for you. I loved the addition of Pale Ale (yes, it’s Boulevard Pale Ale as a nod to my awesome KC Royals with this local brew). Then there is the finish with cheddar cheese. This is a case of do as I say, not as I do here. I used milk shredded cheddar because I forgot to buy cheese and it’s all we had. But please get your hands on sharp shredded cheddar. It’s my favorite cheese to use in a cheese sauce and really increases the cheese flavor. I believe the response I got when I shared these with my dad was “Oh my God these are so good! !” and “Kelli, you need to put these up or I’ll eat them all.” The pretzels had that classic pretzel texture and flavor and dipping them in the sauce was fantastic. You could taste the pale ale and the spice of the sriracha helped balance so it wasn’t too cheesy (in case you believe that is such a thing). So come on and click here for the recipe and step by step instructions…yum, yum, yum!